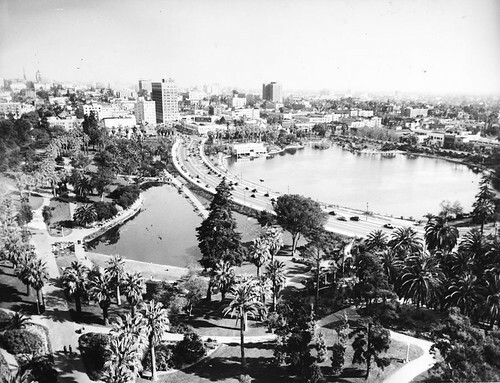 Back at the end of the Civil War, the city of Los Angeles failed to auction off a plot of more than thirty acres westward of the city limits at even twenty-five cents an acre. Too swampy and too far out of town it was, a community dump known locally as the Dead Sea. 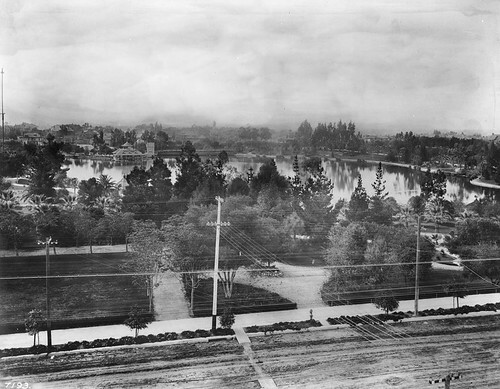 One of the earliest pictures of Westlake Park, from around 1892. 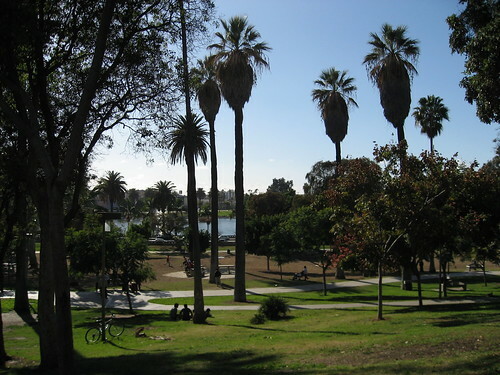 More than twenty years later, in 1887, a group of citizens in the area lobbied the city and Mayor William Workman to transfer the land into a public park. By this time, there were plans to run a streetcar line out to the southeast corner of the lot to service the growing development in the area, like in the new Bonnie Brae tract. Residents of the southwestern quarter of the city are moving in the matter of securing an appropriation from the city for the improvement of their park. 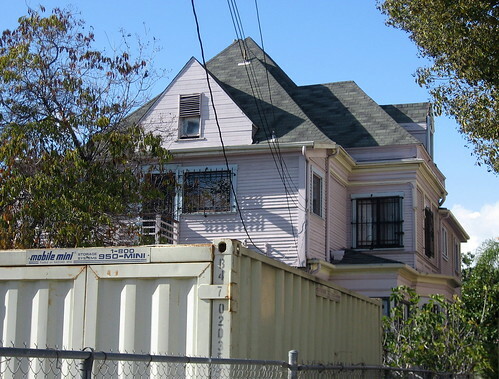 The land reserved for the purpose comprises thirty-five acres, lying north of Seventh and west of Alvarado streets. There is an unsightly gully running through it, which the intention is to make an artificial lake or pond covering about fifteen acres. For this the city has available water, and the expense of turning it in need not be inordinate. For the rest, the park grounds surrounding the proposed lake are a series of rolling hills, having naturally a rich friable [friable adj easily reduced to tiny particles - ed.] soil, and these, under the gardener’s hand, might be rendered very delightful. 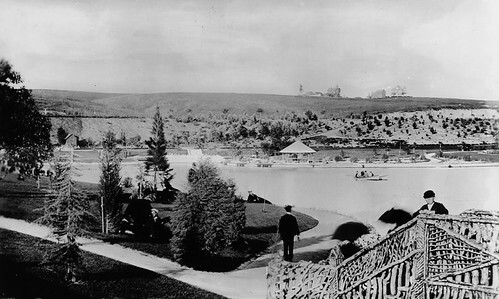 Development of the land kicked into high gear in 1889 when a group of West Side citizens rallied to begin assessing local property owners five dollars per lot to put toward the park’s improvement. The city agreed to match the funds. 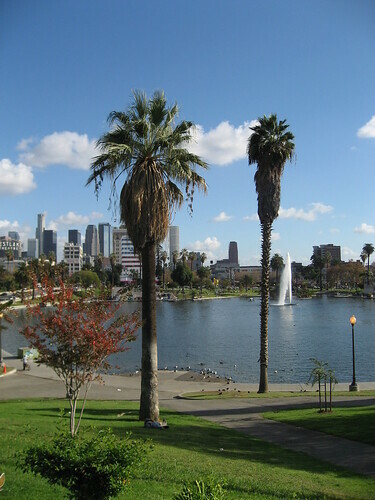 It was also in that year L.A.’s brand new Parks Commission undertook the construction of the lake and boathouse for swimming and boating and a bandstand for afternoon concerts. 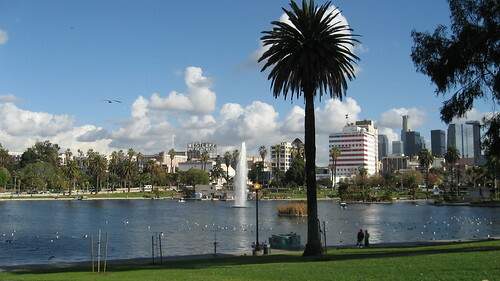 The space became Westlake Park (Westlake’s sister, Eastlake Park in East L.A., became Lincoln Park in 1917). 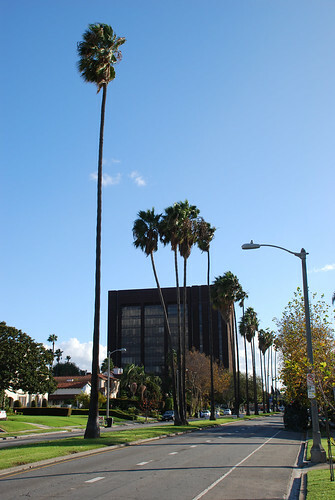 By the early 1930s, Wilshire Boulevard, ending at the west side of the park, had been developed as the fashionable “Fifth Avenue of the West”. 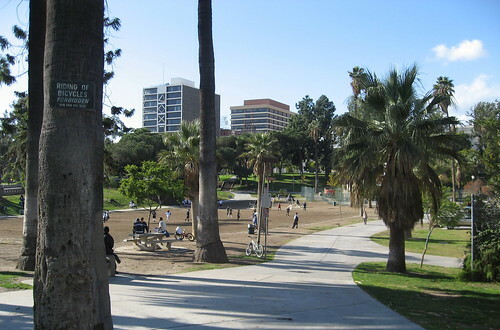 In 1934 Westlake Park was bisected with a viaduct in order to connect Wilshire with Orange Street on the eastside of the park. Orange was widened and renamed Wilshire. 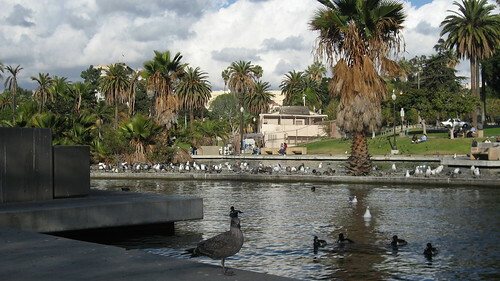 The northern half of the lake, to the left in the picture above, was later drained. 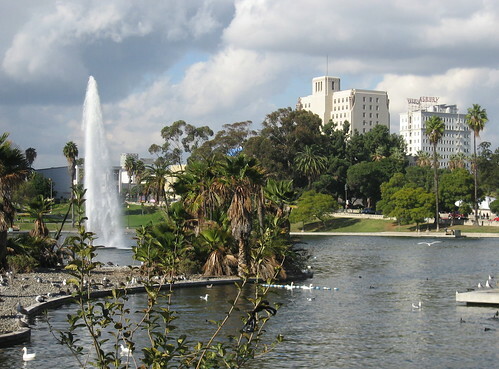 With the U.S. entering World War II just six months earlier, Los Angeles honored the army’s top dog by renaming Westlake Park Gen. Douglas MacArthur Park in May 1942. 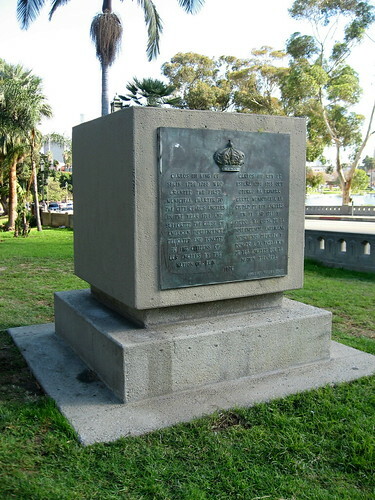 A 1955 park monument (above) by Roger Noble Burnham has Mac overlooking shapes representing the Philippine Islands where he served as Allied commander. Above’s the Levitt Pavilion for the Performing Arts. 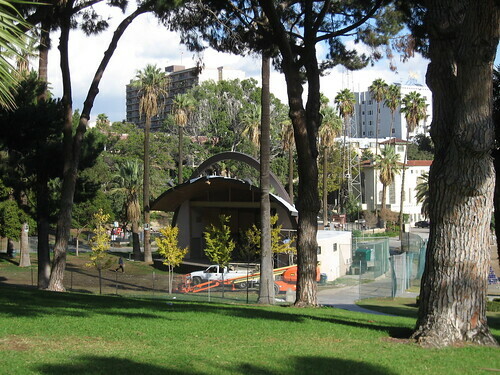 The Friends of the Levitt Pavillion – MacArthur Park produces an annual summer concert season featuring dozens of performances. Below is Nina Saemundsson’s “Prometheus”, dedicated in April 1935. Here’s a blocky 1976 monument dedicated to Carlos III of Spain, supporter of the colonies in the American Revolution. The losing side never gets a monument. 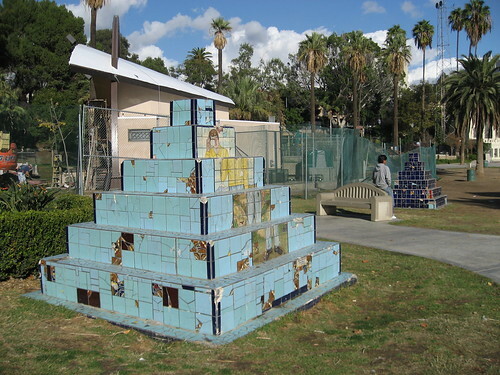 Below is a pair of tiled pyramids made by Judy Simonian with tile by German Rogerio in 1985. The two pyramids are connected with a speaking tube. 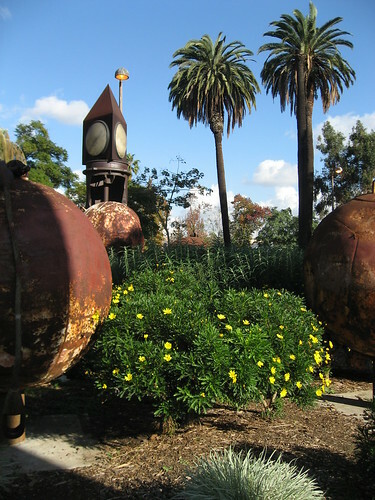 George Herms created "Clock: Monument to the Unknown", below, in 1987 to represent the passage of time. 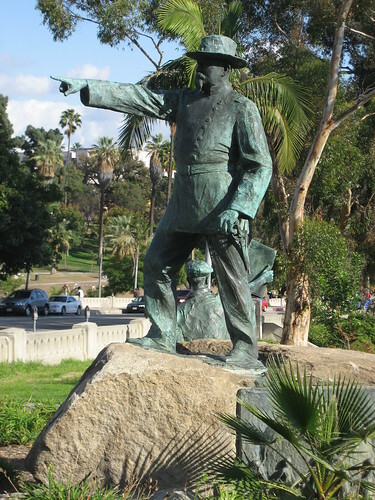 Artist Paul Troubetskoy created in 1920 this statuary tribute to General Harrison Gray Otis. There originally was a third statue – that of a soldier – but he disappeared after apparently being hit by a car. It’s said to be in storage at the Otis Art Institute. "The Elks' Club is thataway." 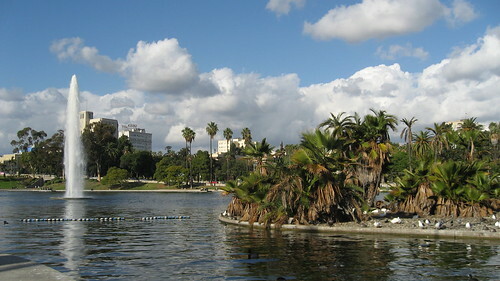 The lake in MacArthur Park has been drained a few times over the years, most notably for construction of the Metro’s Red Line. And while it appears that the park’s worst times are behind it, extremely unfortunate incidents still occur there, in the past year most notably this and this. The black and white shots in this post are from USC’s Digital Archives site. Thanks, USC. At least one neighbor was tremendously suspicious of my taking a few pictures of Los Angeles Historic-Cultural Monument No. 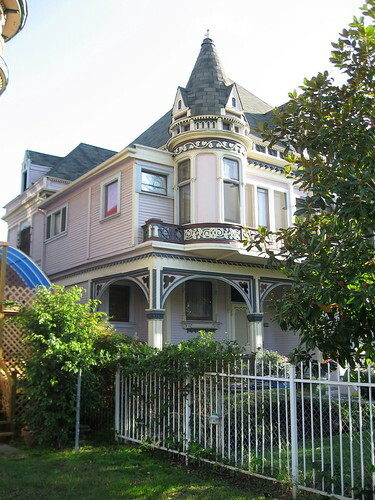 99, this French Chateauesque house on Bonnie Brae just south of Olympic. If he’s reading this, I should confess I’m not a photographer for Architectural Digest. Not a whole lot to write about this one. City records show it’s still a single-family residence, and from all appearances, it looks as thought they’re doing a pretty good job keeping up the place. 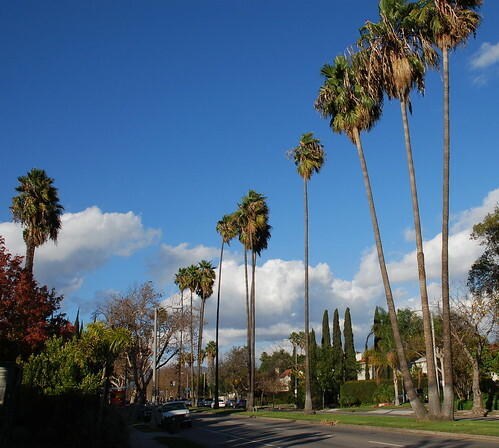 An 1894 L.A. Times article talked a bit about Wesley Clark and E. P. Bryan announcing a new tract of 84 lots, 50 x 150 feet each, lying within the boundaries of 9th Street (James M. Wood Boulevard) and 10th Street (Olympic Boulevard) and Burlington Avenue and Alvarado Street. 9th Street lots were being offered at $1000 each, while corner lots went for $1,250. While HCM No. 99 lies just to the south of this tract, it’s worth noting the Times claiming the area outpaced even the “hitherto incomparable Adams street” in terms of “fine houses and sumptuously fitted up grounds”. 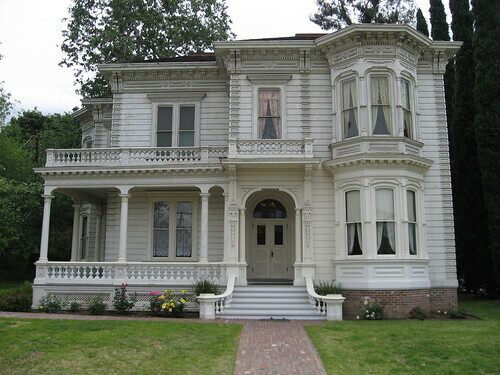 Mt Pleasant House, also known as the Perry Residence, is generally considered to be the oldest mansion in Los Angeles. 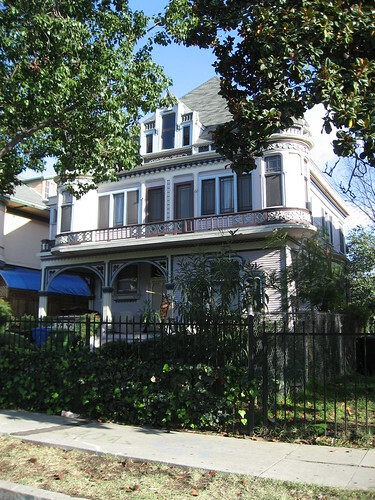 Architects Ezra F. Kysor and W. J. Mathews built this Italianate/Greek Revival home in 1876, the same year as they whipped up St Vibiana’s and a few years after Kysor came up with the Pico House. 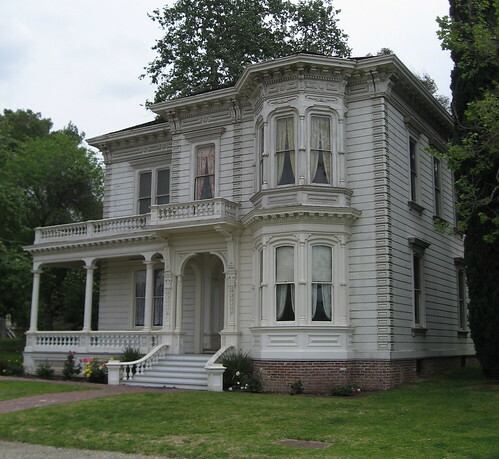 It was originally the home for William Hayes Perry. Perry was born in Ohio in 1832, coming to L.A. as a carpenter in the ‘50s, starting up a lumber and supply business in 1861. 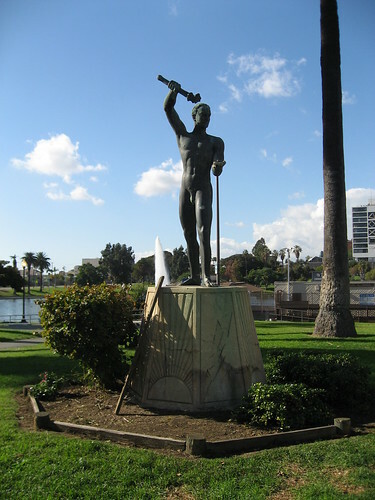 He later served as Los Angeles Water Company’s president for twenty-five years and co-organized the Los Angeles Gas Company, which went on to install the first gaslights in downtown. Perry also sat on the Farmers and Merchants Bank board of directors as well as various and sundry other boards. He even became a city councilman. The 74-year-old Perry must’ve been awfully tired when he died in 1906. Perry’s great-grandson, actor Robert Stack, was born in 1919. The landmark’s second owner was Judge Stephen C. Hubbell, a pretty big muckety-muck in his own right. 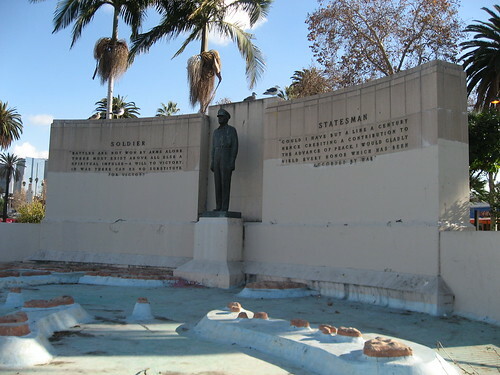 Hubbell “came to Los Angeles in 1870 and was active as a banker, investor and as a member of the city’s first park commission.” Not insignificantly, Hubbell helped organize USC, becoming the school’s first treasurer, also sitting on its first board of directors. 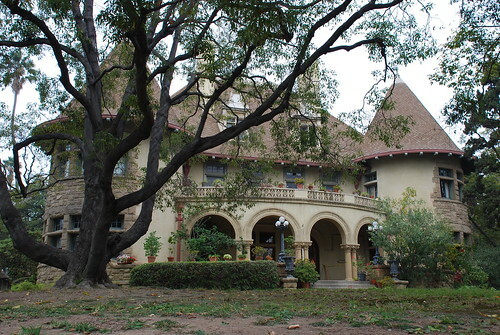 In the spring of 1972, shortly after designation, it was announced the owners, Jack E. Huntsberger and his wife, were giving the house to the National Society of the Colonial Dames of America who had plans to move it to Heritage Square. For some reason, that relocation took more than three years, ultimately occurring on December 18, 1975. 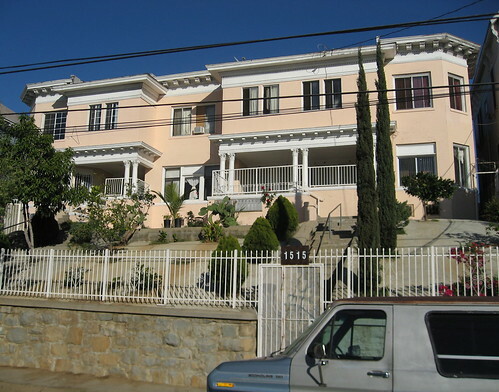 Fortunately, first on the list of rehabilitations was the removal of the home’s more recent pink stucco. For a black and white picture of the home all stuccoed, click here. 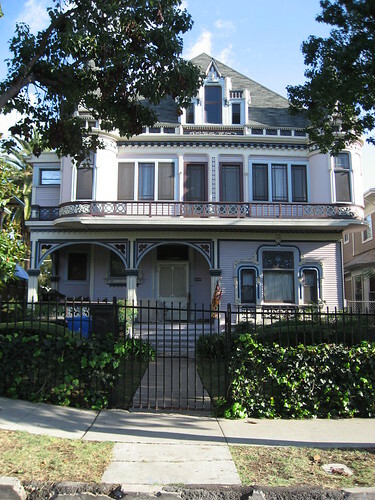 Now, some sources claim the Perry House stood originally at 1315 Mount Pleasant Avenue in Highland Park. Don't believe it. The true first address for HCM No. 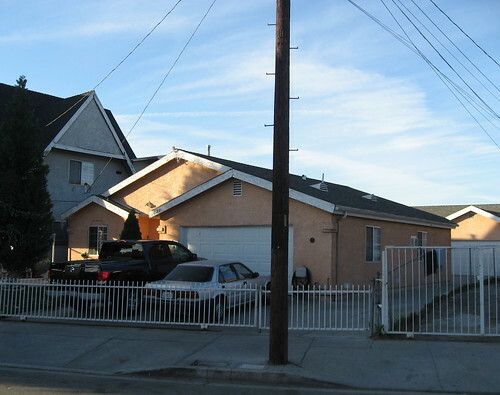 98 was 1315 Pleasant Avenue in Boyle Heights, just up the street from long gone HCM No. 97. The house is huge. 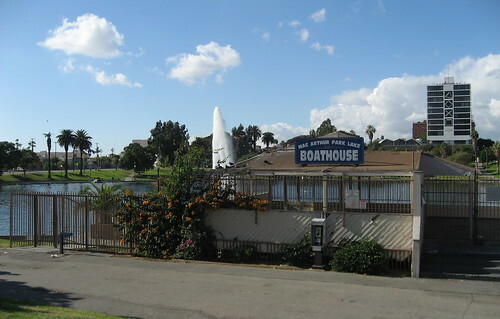 It sports half a dozen bedrooms and a parlor, and they’ve each got a bath and a dressing room. 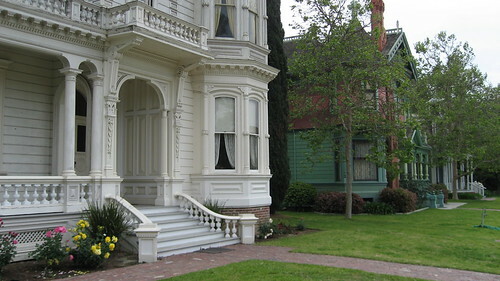 Today, the home is furnished in period style and the downstairs is open to tours. Unfortunately, no indoor photography is allowed. Bah. 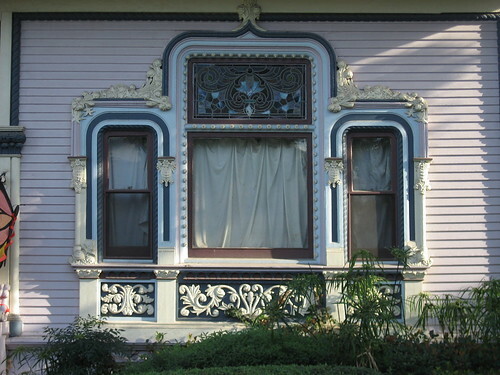 A 1972 designation couldn’t save this rare and fine example of Italianate Victorian Los Angeles architecture. Deteriorated and vandalized to the Nth degree, it was demolished the following spring. 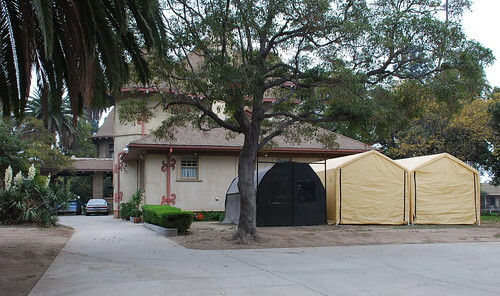 The lot stands about a block away from Mariachi Plaza off the corner of Pleasant Avenue and 1st Street. Today, the building below occupies the site. Compare the edge of 1620’s next-door neighbor in the two pictures, separated by about thirty-five years and at least one coating of stucco. The top shot is from L.A.'s Department of City Planning website. I enjoy walking around this section of Boyle Heights real well. 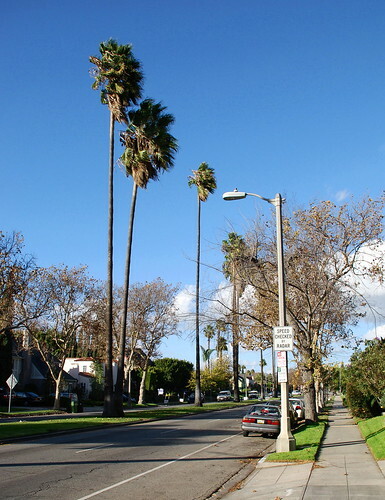 There are lots of old L.A. homes remaining, if only a little worn and tired. I can only imagine how the commodious building below, built around 1907 (an even century ago) and standing somewhat across the street at 1515, appeared in its heyday. Now, it isn’t the most attractive building in the area, but I really find it appealing. With its terrific view of downtown, the apartment complex looks like it’s kept up alright, but what’s up with the cement lawn? Speaking of what’s up, what’s the deal with the coat hanger dangling from the telephone wire? What an odd place to hang laundry. Perfect, then, that the day I visited Wright’s Storer House in Hollywood, there was a roofer on hand doing some repair work (see the above shot). 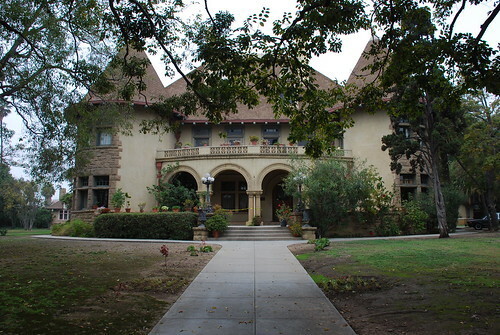 One of five Wright houses in Los Angeles, the home was built for Dr John B. Storer, a surgeon from Wisconsin who turned to real estate after failing the California medical examination. 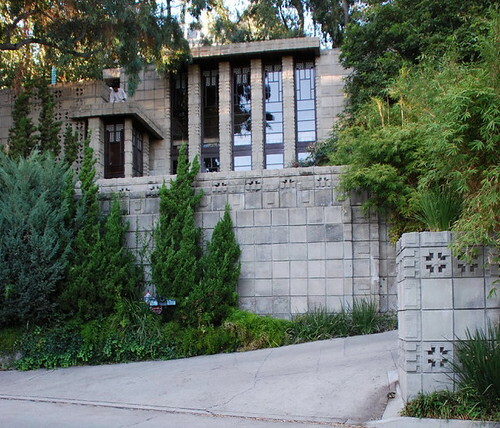 The home is a re-imagining of a design Wright came up with for an Eagle Rock residence for Charles P. Lowes (it wasn’t built). Storer didn’t stick around long. He sold the home in 1927, dying six years later. 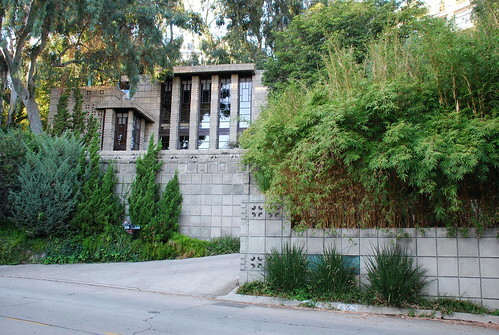 Rudolf Schindler’s wife, Pauline, rented the house for a bit, and the home’s fifth owners, Charles and Helen Druffel, were living here by 1935. 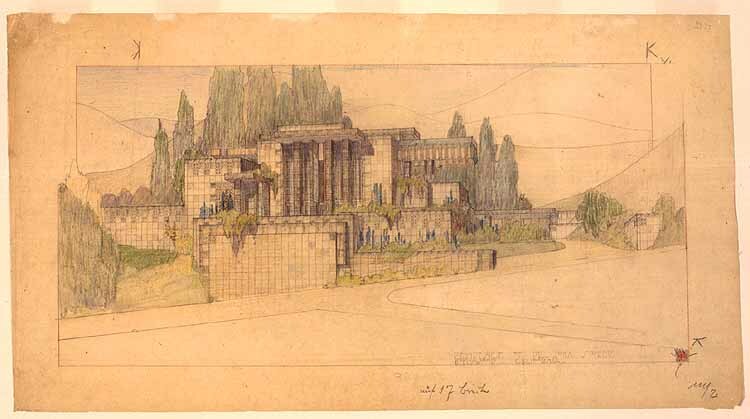 For the Drufffels, Wright made some alterations to the house to block out the homes on the hillside towering above theirs. Although it was designed with five bedrooms and three bathrooms, the highlight is the two-story living room opening onto terraces in both the front and the back of the house. 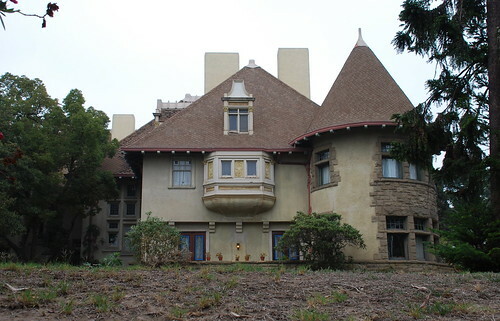 Partially restored in the 1970s by Lloyd Wright, the Storer House was the beneficiary of a full-blown, multi-million dollar rehabilitation in the mid-1980s thanks to movie producer and, um, ultimate Frisbee-creator, Joel Silver. He’s since sold the home to another private owner. Wanna see the inside of the Storer House in person? 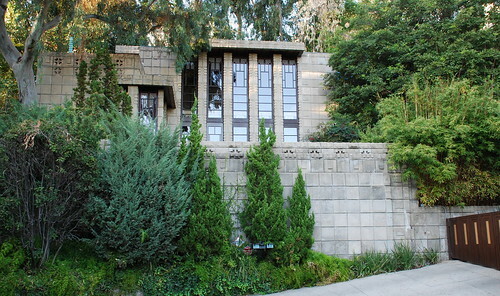 A month from now, January 18, 2008, the Frank Lloyd Wright Building Conservancy is hosting a sit-down dinner benefit at the 85-year-old landmark. The cost is a cool $1,500. Go here for details. This Chateauesque mansion was first the home for land developer, Methodist, businessman, philanthropist, and author Frederick Hastings Rindge. Unfortunately, Rindge didn’t get to live here too long, dying in the summer of 1905 at the age of 48, about two years after the home was completed. Born in Cambridge, MA, in 1857, Frederick Rindge attended Harvard, later inheriting a ton of dough when his father died in the early 1880s. He married a school teacher from Michigan, Rhoda May Knight, and moved out to Los Angeles in 1887. Five years later, he became the final owner of the entire Rancho Malibu Spanish Land Grant, named Rancho Topanga Malibu Simi Sequit or “Malibu Rancho”. At the time of his death, the L.A. Times reported the Rindge Ranch, devoted mainly to raising sheep, had grown to about 20,000 acres, stretching to a mile wide at some points. 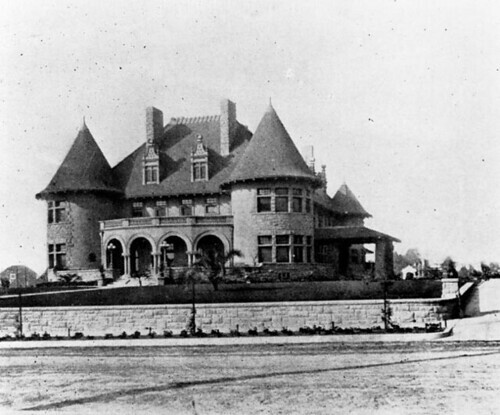 The ranch house, though, had burned down in 1903, and Rindge never got the chance to rebuild. 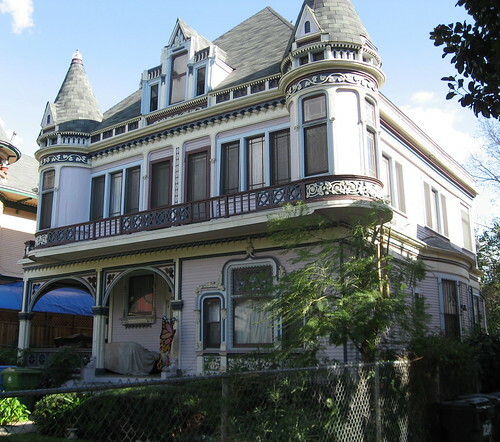 The Rindge House’s architect, Fredrick L. Roehrig, also designed a few other city monuments, including the Durfee House (No. 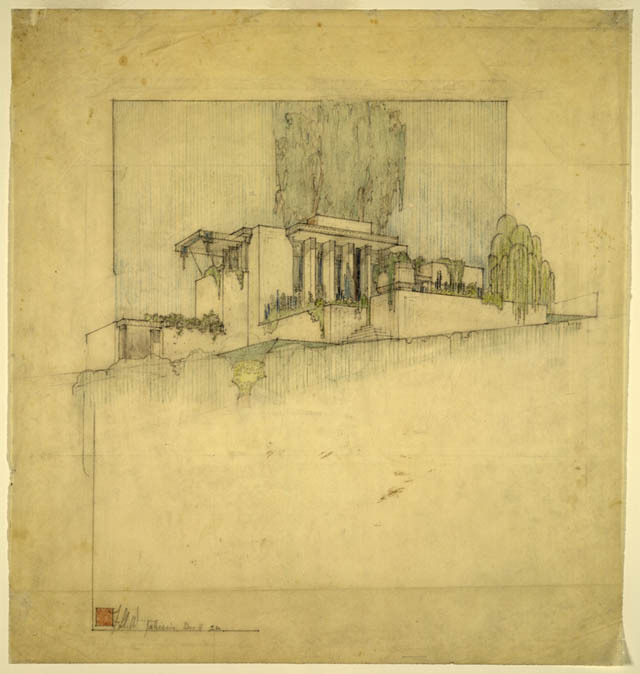 230), the Stimson House (No. 456), and the Department of Water and Power (No. 558). 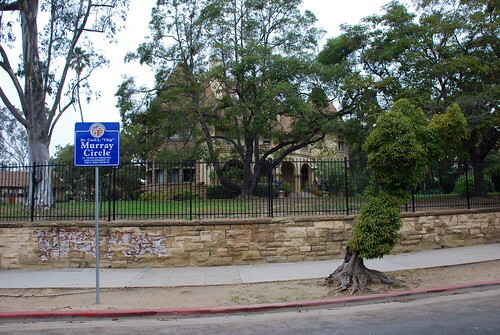 However, his most notable work is probably Castle Green in Pasadena. 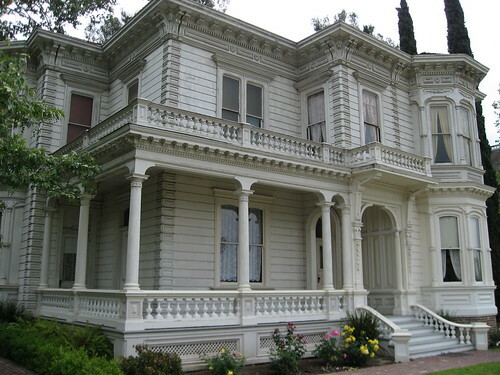 Dubbed the “Queen of Malibu”, Rindge’s widow, May, lived in the city home until her death in February, 1941. 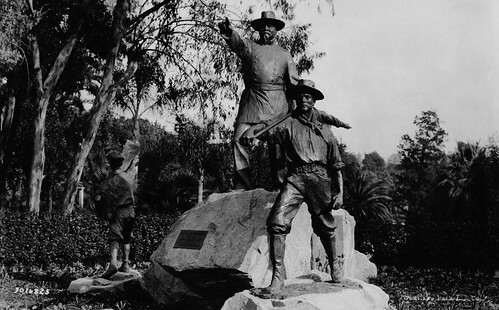 She also remained a controversial figure in Malibu, keeping the Southern Pacific Railroad out of the area by building her own narrow-guage line on the ranch, and, until 1925, by preventing the state from running the Pacific Coast Highway (then called the Roosevelt Highway) through her property. 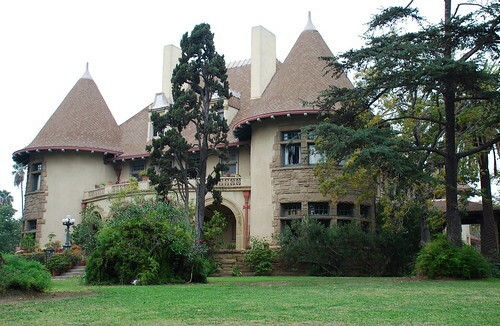 Oh, and Malibu’s Adamson House was built by Rindge’s daughter, Rhoda, and her husband, Merritt. The Rindge House, circa a long time ago. After May’s death, the South Harvard home was used as convent and a maternity home. Today, the Rindge House, along with its old carriage house and storage building, is privately owned, with a law practice operating out of the first floor. It’s also part of Murray Circle, named for Dr Cecil L. “Chip” Murray, pastor of the First A.M.E. Church (across the street) from 1977 to 2004. 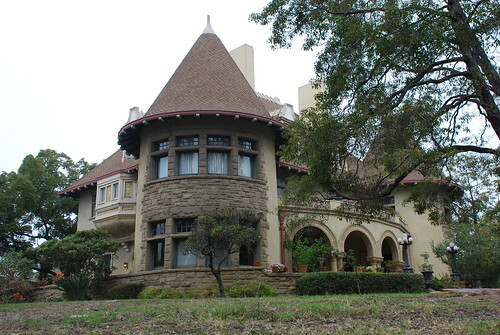 Special thanks to the folks at the West Adams Heritage Association who pointed me in the right direction for the information on Frederick Rindge and his L.A. home. “I do not like Southern California, because the seasons are not distinctly marked,” said an Eastern misanthrope one day. “There is too much sameness in your climate,” the same party continued. “True,” I replied; “we have no frozen water pipes, no March slush, no interruptions from elementary causes to travel, to telegraphing, or to commerce, save a few washouts of a day; we have no Oklahoma cyclones, our barns are not commonly struck by lightning, our citizens are not prostrated by sunstroke in August, our hats are not smashed by falling ice from high buildings in winter thaws; but all the same we have a very reasonable climate.” And as to ‘sameness,’ which you allege, why, our seasons have great variety. Eastern misanthrope. Will a day go by now that I don’t use that one? 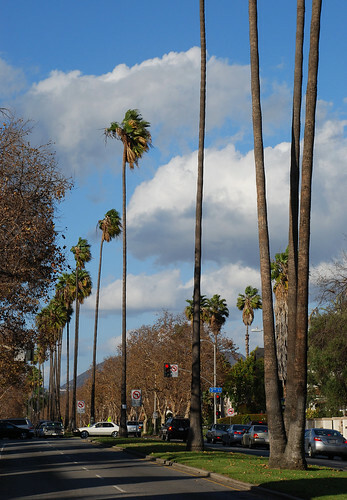 Anyone who’s spent more than thirty seconds in Los Angeles has seen a stretch of palm trees, single-rowed, spaced evenly, along one of our city streets. 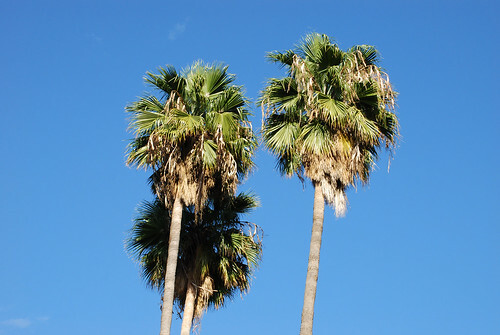 What makes this collection of palms different is they go on for friggen ever. 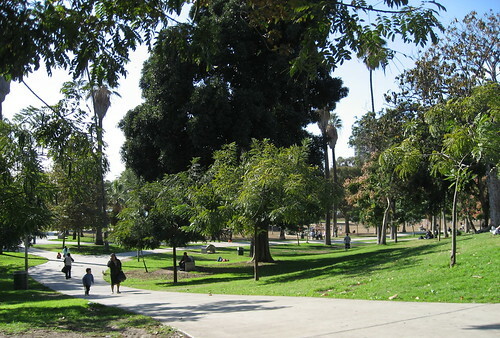 Running through what is mostly Hancock Park, these Queen and Washingtonia Robusta Palms stretch a whole mile and a half. 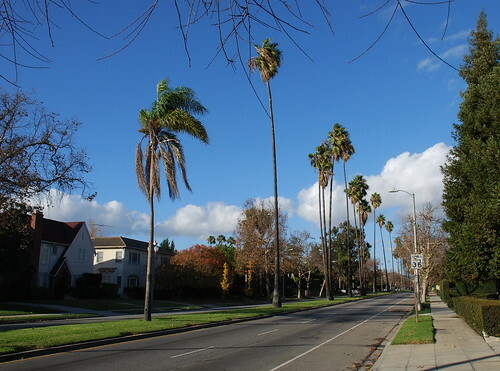 They date back to the late 1920s when Highland Avenue residents themselves coughed up the dough for both the trees and the median as a beautification project (I’m sure they could afford it, too). The afternoon I made it there, I began on foot at the southern end of the stretch, fully intending to walk the whole three-mile round trip. I made it a few blocks before I realized it wasn’t making for the most thrilling afternoon. But I drove the rest of the way, and take my word for it: you seen a couple blocks of HCM No. 94, you seen ‘em all. Oh, one thing about Highland Avenue. 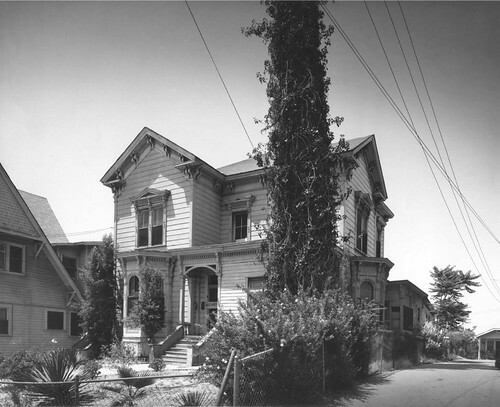 Over on KPCC’s Street Stories site, Kitty Felde reports Highland Avenue dates back to the turn of the last century. 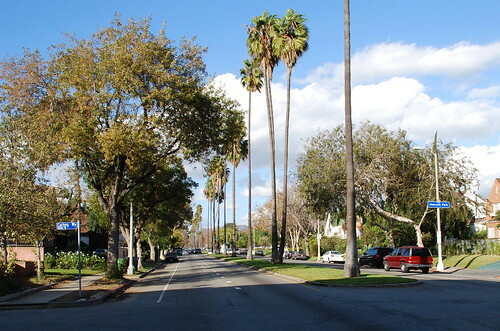 The new avenue ran through land owned by Mary Moll, who, in exchange for allowing the road to run through her property, required the city to name the street after her recently deceased friend, Mrs Highland Price. Now, the good news is this is the last tree monument until May, which is fine by me.